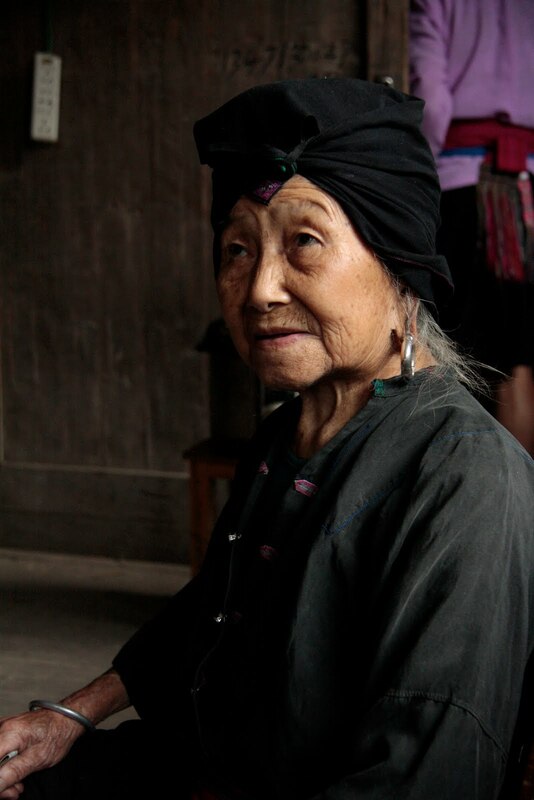 I meet a lovely Yao woman whilst out walking. Chinese is also her second language, so we understand each other surprisingly well - she speaks Yaohua, the Yao dialect in her everyday life. She and her relatives live in the twenty house village below our guesthouse, Tiantouzhai. The villages in the rice terraces seem populated largely by these wonderful and beautiful long-tressed women and their young children, and I wonder where all the men have gone. She tells me her husband is in faraway Guangdong province, working to support their twenty-three year old daughter in her college studies. Between she and her elderly mother they manage to bring in between one and two hundred yuan each year, from rice growing and the occasional work guiding tourists like us between the rice terrace villages, whose paths can be confusing. That's somewhere around $17 to $34 in a year. They survive by growing everything they need themselves - rice, corn, pigs, and chickens. 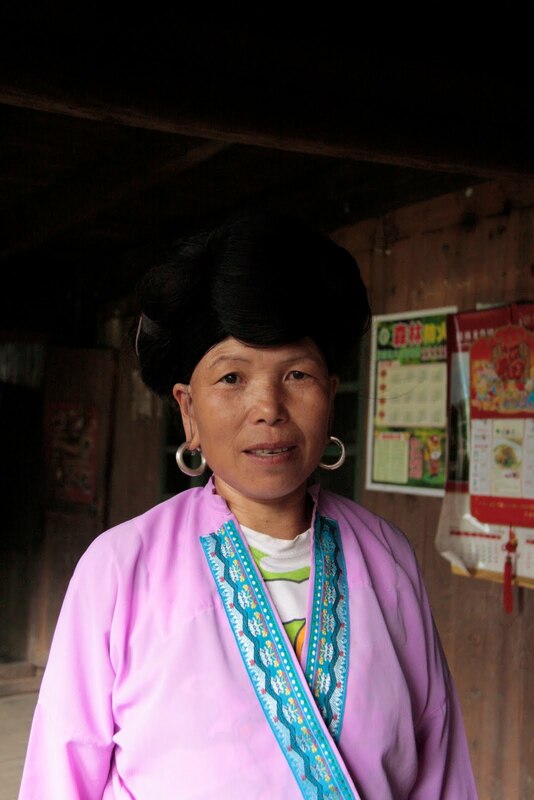 I ask if she will guide us to a village a few hours' walk away - Zhongliu - and she readily agrees. She's not busy, she tells me. Her suggested price is sixty yuan, and I agree - she will take us there and back. 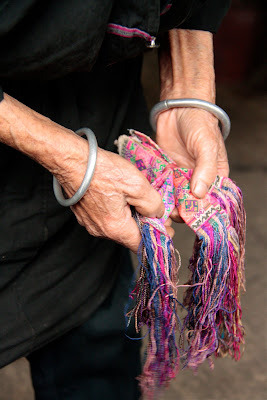 But first we visit her home so she can tidy up out of her workclothes, and check on her eighty year old mother. 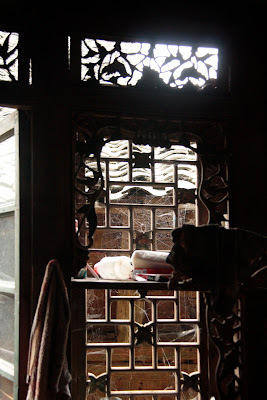 Her home is typical for these hills - a large, rectangular three-storey house built from mountain pine, with carved wooden latticed windows and heavy cross beams, and a roof tiled in the dark grey curved terracotta tiles used all over China. It was built by her grandfather. The ground level is for livestock, here just one pig. We climb the heavy wooden stairs to the first floor. The house is old, as old as her mother, and seems silent and dark. No husband, no children, and no grandchildren to bring it alive. The central area is for living, with sleeping quarters at one end, and the kitchen at the other. 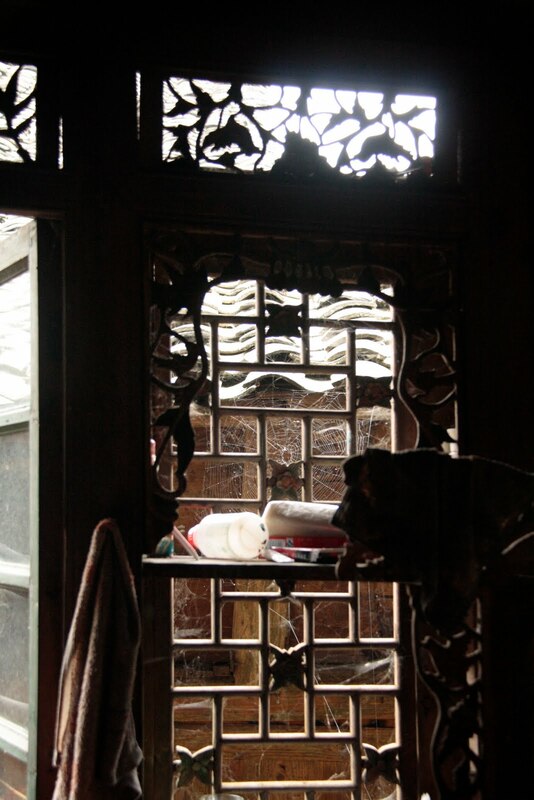 The wooden floors are worn with age, and light filters in through the lattice carved with birds and flowers to a corner of the room where her mother sits on a short wooden stool. The old lady has a beautiful face, worn by years and cares, but holding a gentleness and grace. Her ears hang long with her heavy silver hoops, and she has a silver bracelet on each wrist. Her hair is grey now, but she still wears it in the traditional style with a knot at the front, and covered by a black headcloth embroidered in each corner. She shows me another headscarf she has embroidered - the stitches are so tiny I cannot imagine how she could see them, and each minutely cross-stitched corner square is about 15mm across. 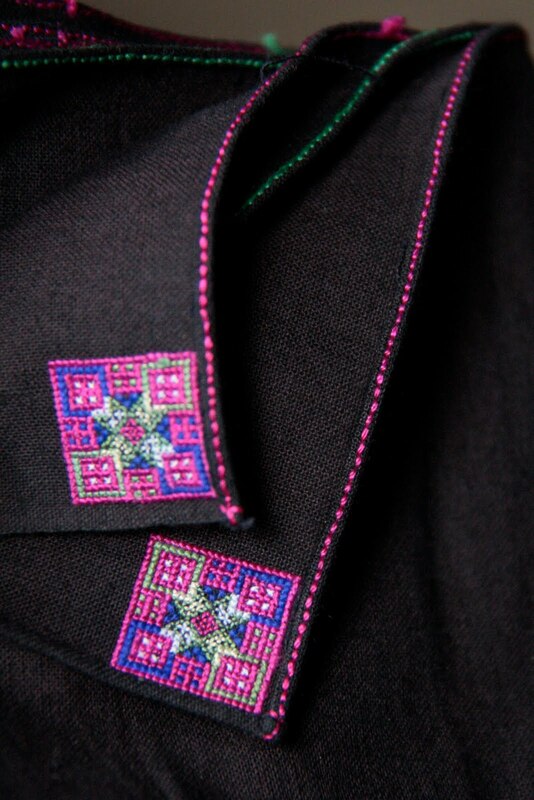 The fastenings on her simple black shirt are in the same colours. 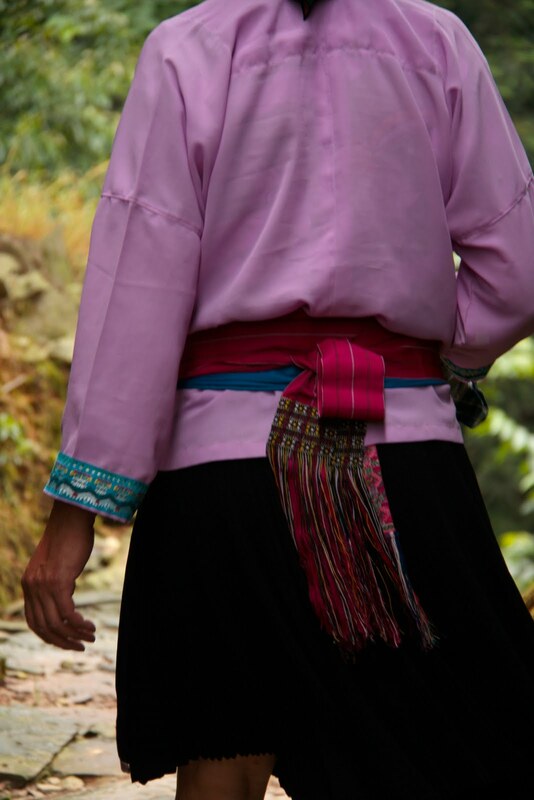 Around her waist she wears a bright pink handwoven sash with tasselled ends, tied at the back with the tassels hanging down. Her daughter wears the more usual finely accordian-pleated black skirt with small embroideries, but her mother feels the chill mountain air at night, and prefers simple black trousers for comfort. Her daughter checks a last time that her mother has all she needs before we set out for our walk. Her mother smiles and grasps my hand strongly as I say good-bye. We set out on the path, and ahead of me the daughter's skirt and colourful sash swish from side to side up the mountain path.